Cellgen’s initial market position will be built on a management philosophy that maintains a sharp eye toward the future but understands the value of executing in the present. Cellgen will initially market its technology as a cancer therapeutic guidance platform that will measure the health of the immune system to better predict which patients are most likely to respond to immuno-oncology cancer drugs…a vastly growing market. Cellgen believes in order for precision medicine to meet its promise and gain broad applicability, genomic technologies will have to meet patients at the point of care and move beyond Oncology. However, RNA based, non-oncology applications are a few years away from being clinically and commercially validated. 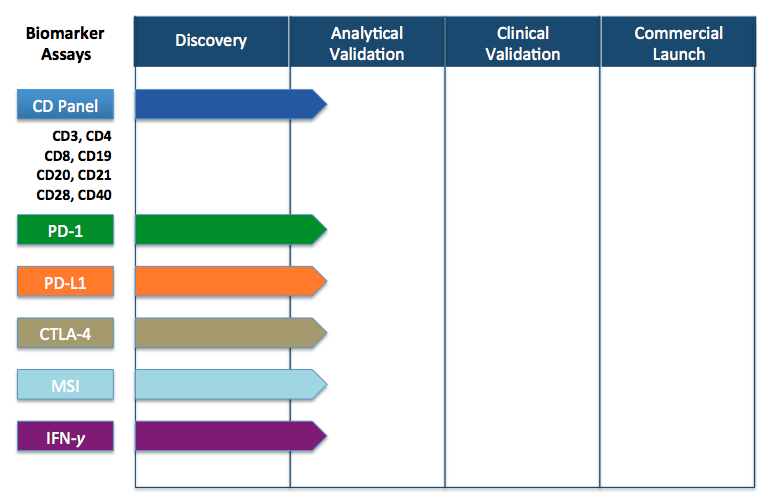 Cellgen will be well positioned once non-oncology applications are clinically validated. Running on Cellgen’s proprietary platform, we are developing gene expression tests that can be used across a diverse set of oncology indications ranging from Lung Cancer to Prostate Cancer. We will also develop tests for monitoring autoimmune and allergy/inflammation diseases. Cellgen’s future viability is exceptionally robust. As the diagram below indicates, the journey from diagnostic inception to actual product launch is a lengthy process.